I have been studying the impact of technology use for decades and have seen an explosion in the use of digital technology—particularly the smartphone—over the last six to eight years. As part of my research paradigm, I have been collecting data on smartphone usage to pinpoint the trends in daily usage and the issues that might be predictive of our obsessive use. Apple, Google, Instagram, and Facebook have all released plans for helping you track your use of their products and Apple’s Screen Time app is now active on all iPhones using iOS12. The reason this has happened is because the detrimental nature of obsessive phone-checking behavior has become so obvious that even the companies responsible for inducing it realize a backlash has begun. 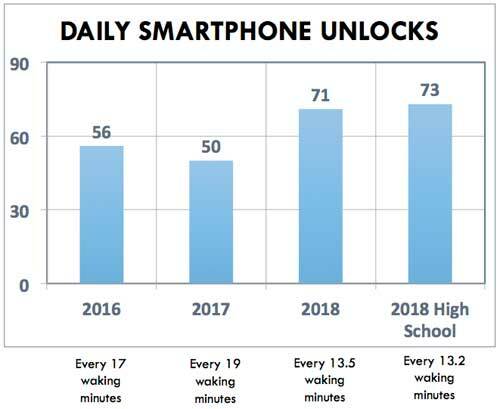 Based on the latest research from my lab, young adults in their 20s and 30s (averaging 25 years old) unlock their phones an average of more than 70 times a day for about 260 daily minutes. Assuming they are getting eight hours of sleep (which is not a valid assumption according to sleep researchers) they are checking in about every 13 waking minutes for about four minutes, and then nine to ten minutes later doing it all over again. 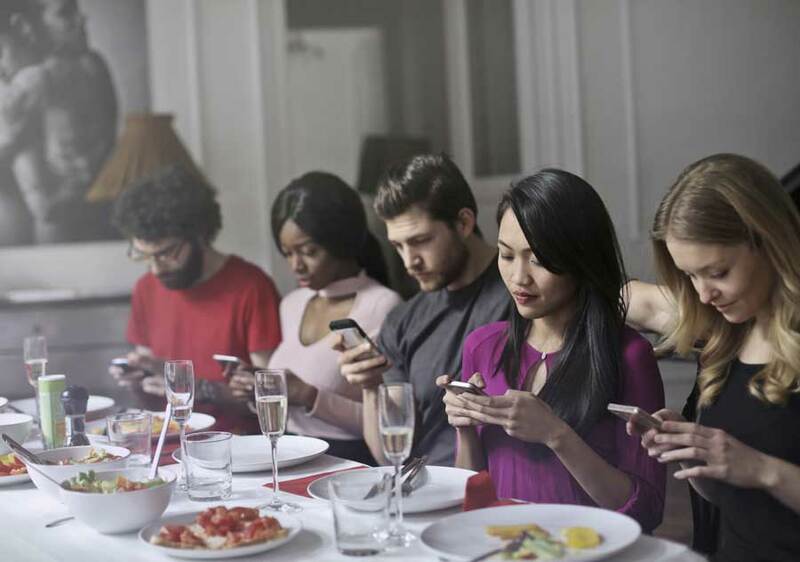 Much of that time is spent on social connection including phone calls, texting and, of course, social media, where young adults averaged six active accounts. Over the past two years, we have seen these numbers rise from over 50 unlocks a day for three hours and 40 minutes to more than four hours a day. In a pilot study conducted in 2018, high school seniors were spending nearly five hours a day on their phones. As you can see from the attached charts from our study (still in progress), the total increase comes despite a reduction in time spent per check-in, from four to five minutes to less than four. Nearly all of our young adults and high school students tell us that they are surprised that they are spending so much time on their phone, but even knowing this, they make no effort to reduce it. For our studies we had students use a third-party app to track their behavior (Moment for iPhone users and Instant Quantified Self for Android users). Google has joined Apple and offers a built-in “Digital Wellbeing” app on their Pixel phones running Android 9 Pie, to provide specific information about notifications and use of apps. This will provide users with the what—data on what they are doing on their phones and for how long. The apps will not provide the why—what is causing people to use their phones obsessively. We know that half the time a phone is unlocked, an alert or notification is responsible. However, the other half the time, there is no alert except the one inside the owner’s head telling them to check their phone. I have been studying the “psychology of technology” for three decades and have written seven books on the topic. That experience, combined with our current research, suggests several reasons why we do these seemingly obsessive/compulsive repetitive actions. Information foraging theory attempts to explain our online behavior with the analogy of animals seeking food. We may be making the same mistakes that animals make when they leave one patch of food prematurely to go to another patch—only to be killed by a predator. Here are some of the reasons why we act this way. First, our digital ecosphere is omni-accessible. We carry our phones close to our bodies and sleep with them at our bedside. And that doesn’t count our other devices. A 2018 Nielsen report found that American adults spend more than 11 hours per day behind screens; smartphones account for less than a third of that time, with the rest allocated to televisions, tablets, and computers. Second, we have built up a “social obligation” to our friends in the virtual world where we have promised—by rapidly responding to notifications—that we will continue to act like Pavlov’s dogs. We stare at those little bubbles while awaiting an incoming text message, or we feel pressured to “like,” retweet, or favorite as soon as we can so that we don’t disappoint our friends. FOMO (fear of missing out) is real—we do worry about missing out on posts or other social media missives, but this anxiety-based experience is self-induced. Nobody asked us to be a rapid responder when social media started. We just learned this behavior. 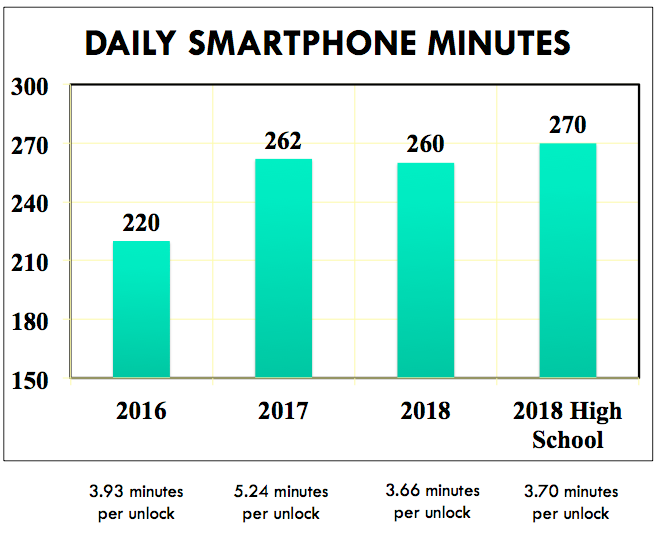 The chart below from Common Sense Media shows that social obligations, particularly among teenagers, have skyrocketed in the last few years. 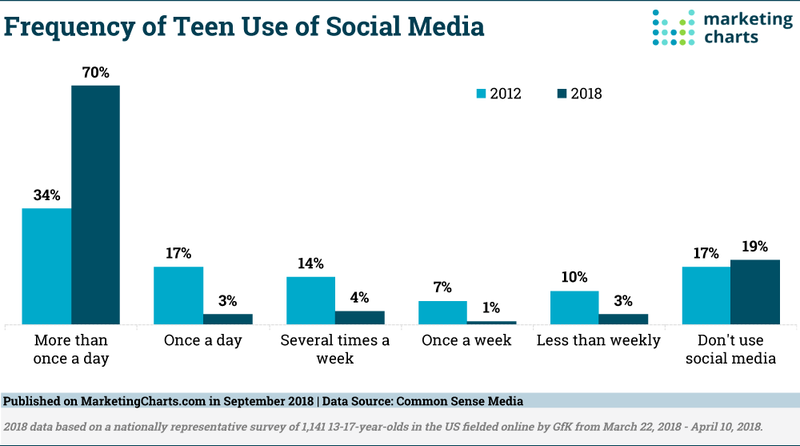 Data from our own research in progress shown below indicates that the majority of Millennials have an active presence on six or more social media sites, making for a lot of social obligations. Third, we are making poor decisions about how to allocate our time. Metacognition entails understanding how our brain best operates. When we lack this ability, we make choices that are counterproductive, such as using our devices while watching TV or studying, or constantly checking our phone in social situations. We think that we can juggle multiple tasks and perform each well, but, in reality, we are poor multitaskers. Research that colleagues and I published in the journal Pediatrics in 2017 indicates that young people attempt to multitask more and believe that they can do it all. Sadly, this research also shows that those who feel that they are good multitaskers and multitask more are actually poor multitaskers. Fourth, we are suffering from a new affliction that some call nomophobia (no-mobile-phone-phobia). When we are separated from our smartphones we start to get anxious rather quickly—within three to five minutes, according to most research, including a 2018 paper I co-authored in the Spanish Journal of Educational Psychology. If you have experienced phantom pocket vibrations from your smartphone then you should be aware that the root cause is anxiety. Just a few short years ago, if you felt a tingling near your pocket, you would have reached down to scratch an itch; now you reach for your phone (oddly often even when the phone is in your hand). Finally, we have forgotten how to be bored. We are no longer able to sit with our thoughts. This causes us to self-distract in order to quell the anxiety, most often by checking in with our virtual social obligations. Just watch people, waiting in line, at a stoplight, or walking across a busy street. 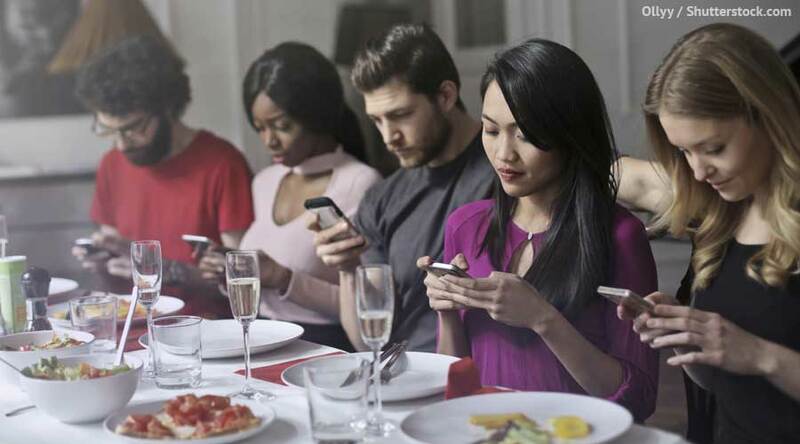 Clearly, the short wait to check the phone is too much to bear, overwhelming our ability to engage in free thought or have a conversation with someone close by. Once we understand the why of the problem, we can investigate the hows of the solution. In The Distracted Mind: Ancient Brains in a High-Tech World, neurologist Adam Gazzaley and I provide myriad strategies from both neuroscience and psychology to help you stay focused and not fall into the distraction trap. One simple strategy is to decrease the ease of access that reinforces obsessive checking. Take all social media apps, place them into folders, move those folders to the last page of your home screen, and embed the folders within each other. Have your smartphone “forget” your passwords so you have to log in every time. This may not stop the use of social media, but it will give you time to ask, “Why am I doing this?” and perhaps reduce the likelihood of checking in so often. Another strategy is to reduce cues. Remove all alerts and notifications (except perhaps from family and close friends). Eliminate all the hard work that those behavioral scientists have done picking specific Pantone colors to seize your attention by changing the entire smartphone screen to grayscale. Move the phone from the bedside to a less accessible location at least an hour before bedtime. This has been shown to improve sleep quality because the blue light from the device retards the melatonin essential for sleep and increases cortisol, which is arousing. If you can’t stand not using your phone in bed you can use an app such as Night Shift to slowly change your screen from bright blue/white light during the day to a warmer color at night, giving your biochemistry a chance to help you feel drowsy and fall asleep. If you really want to take more control of your social media habit, create a schedule—check only every few hours or at specific times of the day—and stick to it. Remember to let everyone know you are going to be reducing your social obligations so that they learn to modify their expectations. A final issue concerns tech companies themselves. Alerting us to how much time we are spending on our phone and even on specific apps is fine, but that has not stopped tech companies from applying behavioral psychology principles to attract and keep our eyeballs. Tech companies need to understand that the research is showing that too much screen time is not good for our well-being and may be predictive of symptoms of psychiatric disorders such as OCD and depression. For more on this important topic check out The Attention Merchants by Tim Wu and Hooked by Nir Eyal. I have always considered myself an optimist about the benefits of technology. I fell in love with computers at a very young age by watching a dot matrix printer render a picture of Mickey Mouse in the computer lab at UCLA at their annual campus open house. However, when I consider the data that is being collected and the growth of our obsessive device use, I am very concerned. Drivers feel compelled to check their smartphone when stopped at a 45-second stoplight, only to have other drivers honk at them when the light changes and they are still engrossed. People stand in line scanning their phone rather than talking to others in line with them. Couples watch television while second-screening with their devices—not only missing the TV narrative, but the opportunities to interact with their partner. The list of distracted behaviors goes on and on. As of now, the pendulum has not completed its swing. I don’t see much evidence that it will until we all pay attention to the what and why and start invoking the hows: conscious strategies to reduce screen time and enhance our life experience.